To promote the premiere of Daredevil Season 2 at Netflix on March 18th, the cast and showrunners were at the TCA Press Tour to preview what fans can expect from the characters next. 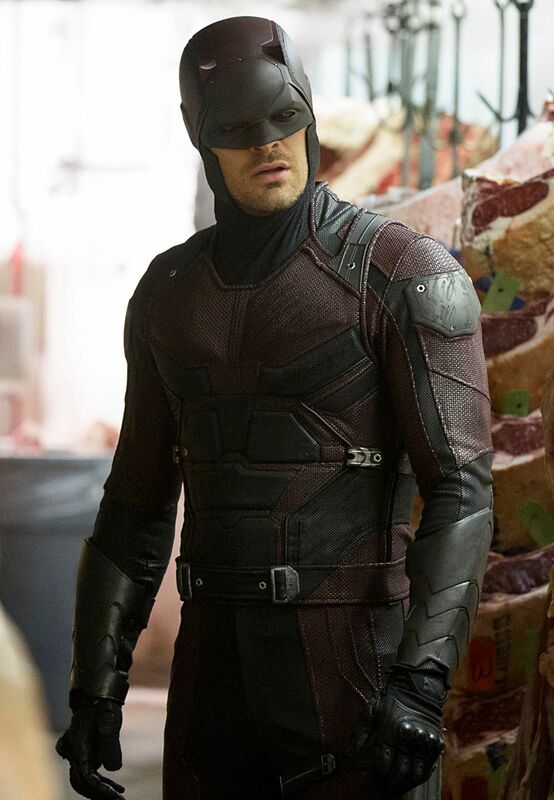 With Matt Murdock (Charlie Cox) having grown into the role of the vigilante Daredevil, the attention that he’s received has been noticed by both the public and the police, inspiring other vigilantes to enact their own vengeance for injustice around the streets of Hell’s Kitchen, New York. During a small roundtable interview, co-stars Elden Henson (who plays Matt’s best friend and law partner, Foggy Nelson) and Deborah Ann Woll (who plays Karen Page) talked about why they enjoy these characters, how long Karen can be in the dark about Matt’s superhero identity, how the dynamic between them will change, what The Punisher (Jon Bernthal) and Elektra (Elodie Yung) bring this season, Foggy and Karen’s own personal journeys, and what they thought of Jessica Jones. Be aware that there are some spoilers. Question: Deborah, what do you most enjoy about playing Karen Page? DEBORAH ANN WOLL: The things that Karen wants to do and will do willingly are things a little outside my own comfort zone. Even just pestering people with questions, and being nosey and pushy and getting her way, are things I think many young women grow up struggling with, to assert themselves. I love how assertive she is, even sometimes to a fault. I like that the role asks me to do that, even when I wouldn’t ever do it in my life. 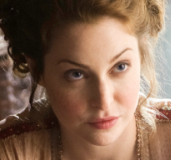 How does playing Karen compare to working on True Blood? WOLL: I was actually thinking about that a lot the other day because, as Jessica, everything was new. She was young and she had changed species. Things were vibrant, everything smelled richer, and things were more colorful. The world was this open book that she wanted to step into, and she had no fear because she had no sense of, “I might get hurt, if I do this.” And Karen is interesting because it’s so much more, “I want to observe and I want to understand, and then I will jump into the darkness.” But it’s also, “I’ve been hurt before and I’m going to come into this with my guard up.” Instead of being more colorful, things are darker and grayer and more uncertain. Even though she wants to be certain in her ideals, I don’t know that she can be. 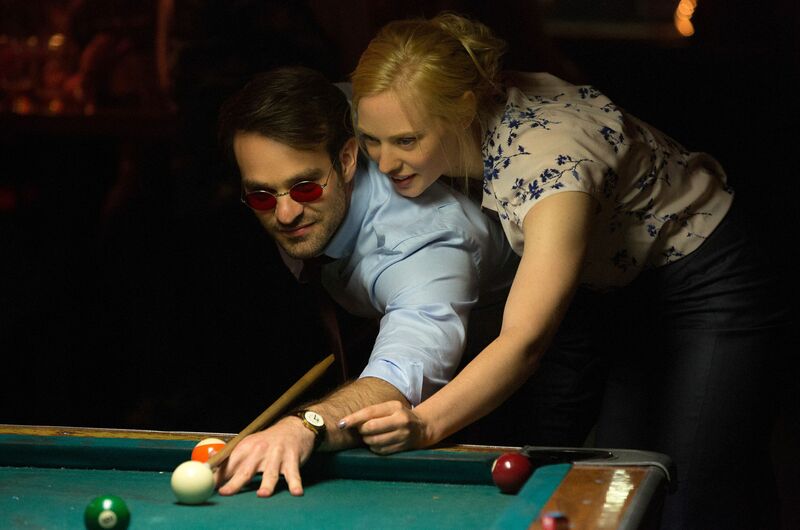 Karen is the only character within Team Daredevil who doesn’t know that Matt Murdock is Daredevil. What’s that like to play? WOLL: For a lot of different reasons, I have a policy that I don’t actually watch the work that I do. There are all kinds of reasons to do that, but one really interesting side effect that has come about from that is that I have no imagery of the show that isn’t from first-person, through Karen’s eyes. So, I haven’t actually seen Daredevil more than twice, in my life. As her, I’ve only seen him twice. There’s something kind of wonderful in that. What that means is that every time I encounter Daredevil, as Karen, or think about him or anything, he’s like a ghost. He’s this exceptional being that I have no concrete sense of, and I like that. I like that the fictional side of it doesn’t get in the way of being able to experience that. So, it was fun, in those first few episodes, as I start to challenge Matt for these weird things. I believe that Karen wouldn’t connect the two yet. She knows something is up with Matt, but I believe that she wouldn’t connect them because I’m actually experiencing this and there’s not enough evidence yet for me to connect them. It’s fun. She’s smart. She’s a smart cookie, especially in that first episode. She says, “Okay, well, maybe you’re a drinker, maybe not, but I kinda think you’re not. I think something else is going on here.” He can tell Karen all he wants that that’s what’s happening, but she’s smarter than that. 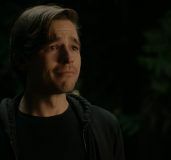 Elden, in Season 2, Foggy is essentially the only person looking after Matt Murdock because Matt isn’t even looking out for himself. How will the relationship between them be changing? 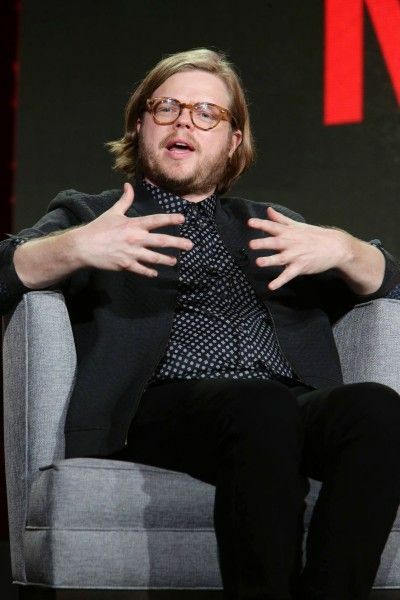 ELDEN HENSON: It is changing, but it’s also much of the same. Matt and Foggy have a brotherly kind of relationship. Ultimately, Foggy just really cares about his well-being, no matter what he’s doing. He just wants him to be safe and he wants to protect this thing that they’ve built together. And now that Karen has entered their lives, he just really wants to keep everything the same. He gets a little bit stressed out with change. Wilson Fisk was just such an engaging villain and Vincent D’Onofrio was so charismatic onscreen that it’s hard to top that. What’s it like to have The Punisher be the main villain, at the beginning of this season, and how having him and Elektra around will change the feel of the show? HENSON: This is just from a personal standpoint, but the energy and excitement that people bring, being new on the show, gets us all super pumped. When we heard Jon [Bernthal] was going to play The Punisher, I know I was like, “That’s perfect casting!” He’s like an exposed nerve. He’s just really, really intense. I was excited. We just have such a great group of people on our show, with cast and crew and everyone, so any time we can get more people at the party, it’s always good. WOLL: And I don’t know if this speaks to things being different – it might actually speak to things being the same – but something really interesting is that, even though the villain in the first season was Kingpin, and this year we have The Punisher, I actually find that I call them Wilson Fisk and Frank Castle more often than I call them by their villain names. I think that that speaks to what our show is trying to do, and that all of these people are people first, and then they are the superhero or supervillain. What you saw with Vincent, and what you will see with what Elodie [Yung] and Jon bring to it, is that these are human beings first, and they are complex people who take on these personas to help them get done what they have to do. Foggy and Karen come into the cross-hairs of Frank Castle, but what are their personal journeys this season? HENSON: It’s difficult to answer that question without saying things that we’re not allowed to say. I think the great thing about this show is that each character does have their story and their things that they’re going through. There’s not a whole lot of characters on this show that just serve another character. We each really have our own arc. It’s much of the same, and the exciting thing is that each one of these characters continues to grow and evolve. This show is ultimately about a hero, but your two characters are really critical to the story, as well. How would you describe their roles in the bigger story? WOLL: I think heroism comes in different packages. The superhero package is one that we’re familiar with, but I looked at that stuff first season with Elena, and I see what a hero Foggy is, just showing up to fix her plumbing and patch her walls. That is heroic, no two ways about it. And Karen is searching for truth and saying, “People did something awful to me, and I’m not going to stick my head in the sand and just let it happen to other people.” I think there’s real heroism in that. I like the idea that, as a triad, we can represent brawn, brains and kindness, and all the different ways that you can contribute as a hero. HENSON: Especially with Karen, Foggy and Matt, we’re ultimately in pursuit of what’s right. We each have our idea of what right and wrong is. Some people have a bigger gray area than others, but we all have that in common. We just want to do what’s right. 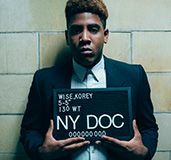 Season 1 was pitched as a crime drama first, and then a superhero show. For Season 2, what can you say to tease what the crime angle is going to be? WOLL: What The Punisher and Elektra bring is the more extreme side of Daredevil. Daredevil has this code of he won’t kill people, and he has boundaries that he has decided make him right and anyone who crosses them wrong. But, who’s to say that his boundaries are right? I think the questions that we’re asking throughout this season are, who decides who is a hero and who is not? Why does one way work better than the other? Does that even matter? I think Foggy and Karen certainly get caught up in that discussion. I think that’s about all we can say. What did you guys think of Jessica Jones? Have you watched it? HENSON: I really liked Jessica Jones. I thought it was great. I was really impressed. I don’t have a background in comics. This whole world is very new to me. So, watching their show or our show, or any of the Marvel shows, is exciting, as a fan. I go in blind, which is always the best way for me to see things, to know as little as possible. 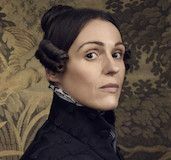 WOLL: When I first heard about this whole thing that they were going to do, I was really worried that audiences would want to pit the shows against each other. But I just remember with Jessica Jones going, “This is so good, stand-alone.” It all feels like it’s of one world, but at the same time, they have their own legs and I don’t have to worry about people comparing us, in an unfavorable way. It’s cool. HENSON: It’s a testament to how smart the people at Marvel and Netflix are. They’ve created this world, but each one of these shows really has its own feel to it, and that’s really hard to do. Somehow, they’re pulling it off. I wouldn’t be able to do it. It’s pretty cool. I’m really excited for Luke Cage, too. I’m hearing really, really amazing things about it. Daredevil Season 2 premieres at Netflix on March 18th.